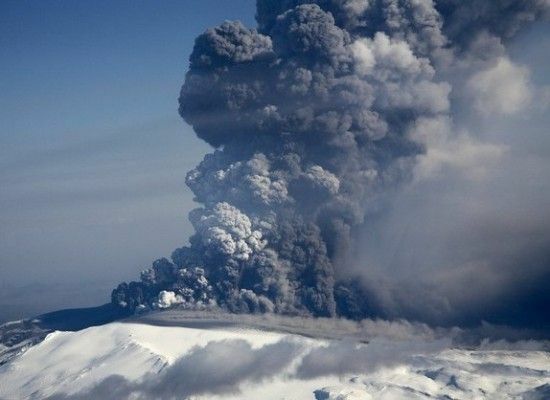 The recent eruptions from the Eyjafjallajökull volcano this past week has caused havoc with European air carriers, bringing everything to a virtual stop. Something along the lines of 60,000 to 80,000 flights have been disrupted, stranding passengers and cargo in place, having a huge effect on the economies of numerous countries. And to think, this is a pretty minor eruption, with a historic record of followup eruptions that have taken place after the first ones in surrounding Volcanoes. Volcanoes are one of the world's most powerful forces of nature, literally fire from the Earth itself, a force that has proved to be incredible devastating throughout planetary history. During my college years, I minored in geology (a trait that I seem to have inherited from my father, who is a professional geologist), and it remains a field that I continue to find fascinating, beautiful and awe-inspiring. In 2005 and 2006, I travelled to the American Southwest with the geology department for two separate trips to study the regional characteristics in the beds of rock below the surface of the Earth. While most of my geologic interests centered around sedimentology and stratigraphy (studying sedimentary rocks, and interpreting the conditions in which they were laid down, respectively), there are some parallels with studying igneous rocks and the larger structures that are formed in the presence of volcanoes. Walking in and around volcanoes is an awe-inspiring thing to do, and it's an experience that I would really like to repeat sometime in the future. Volcanic activity occurs when molten rock from the Earth's mantle pushes its way up into the crust and onto the surface. There are three general methods in which this is presented: shield volcanoes, cinder cones and stratovolcanos. There are a couple of other out there, but those are the general types. The formation of each respective volcano depends greatly on the surrounding environment in the crust in which it is formed. There is a key element that helps to dictate the type of volcano that erupting magma forms: Silica. The explosive nature of a volcano depends greatly on the viscosity of the magma, which in turn determines the gas content within the magma. From Princeton University: [Viscosity is the] resistance of a liquid to shear forces (and hence to flow). In a nutshell, this means that something with a high level of viscosity will have a higher resistance to flow: it's thicker. Something with a low viscosity will have less resistance. The move viscous something is, the better it is at releasing gases trapped within the magma. The more gas within magma, the more explosive potential within a volcano. This is why features such as the ones that created Hawaii constantly erupt with little disruption to anyone outside of the lava flows: the gasses within the magma allow for it to escape, and as a result, there are a number of very smooth flows of molten rock that spreads out from the origin, resulting in what is called a shield volcano, because of the shape that it forms. Here, the magma is classified as Mafic, which has a lower silicone content within the minerals that compose the flow - the resulting rocks tend to be rich in pyroxenes and olivines, and are darker in color. The other major class of volcanoes is the Stratovolcano, which form over major subduction zones, such as what you would find ringing the Pacific rim. The magma here tends to be classified as felsic, with a much higher silicone content, which is more viscous in nature and allows for more gas to be trapped within. These volcanoes tend to be very tall, with high peaks composed of alternating flows and debris from prior eruptions. Cinder cones tend to be found on both types of volcano, and are usually one-time events that build mounds of basalt to some impressive heights. The Stratovolcanos are the ones that are problematic, because they have effects that stretch far beyond their immediate vicinity, as we've been seeing with Eyjafjallajökull in Iceland, and more notably, with the Krakatoa eruption of 1883. This was one of the most violent eruption (About 13,000 times the strength of the Hiroshima atomic bomb) in human-recorded history, and had profound, long term effects on global climate. Following that eruption was a marked drop in global temperature (1.2 degrees C, according to Wikipedia). Eruptions of this nature do far more than throw out lava from the vents: pent up energy within the magma builds, then explodes, vaporizing rock and throwing up a massive plume of ash, debris and dust. Larger particles come down the quickest, given their mass, and the further from the volcano you go, the smaller the debris. The dust thrown up in an event such as this rises and moves to the Stratosphere, where it can be carried around the globe. This pumps other gasses into the atmosphere, which in turn helps to deflect sunlight from the planet, allowing for a cooling event to occur. The dust and gasses in the atmosphere has the added effect of filtering out sunlight, leading to some spectacular sunsets. Another notable event was the 1816 'Year without a summer', which had in turn been caused by the eruption of Mount Tambora the year before, which is likewise one of the most powerful eruptions in known history, at roughly four times the Krakatowa eruption. In this instance, a massive global cooling occurred, affecting the Northern Hemisphere by destroying crops and precipitating a famine. Here in Vermont, snow fell each month of the year, and the eruption would have an affect on the planet's climate for years to come. Most of the major eruptions in recorded history have been relatively minor, with explosions of Krakatoa and Mount Tambora occurring long before the advent of modern society and globalization. The dust that is thrown up into the air by the explosion is very fine, and has the ability to completely ruin mechanical engines, resulting in the grounding of air traffic around Europe, and soon, most likely Canada. Keeping in mind that this was a relatively small and localized eruption, imagine what will happen when there is another eruption on the scale of one of those eruptions. In that instance, we will have quite a lot more to worry about than stranded passengers.